The third competition day was the day of the AP flags and postponed starts. I had to start three times in heat 2. It was a good training and could nail a quite good start at the third attempt. My new Code Red 9,0 works excellent in the light wind. In between the races iwent for some runs. 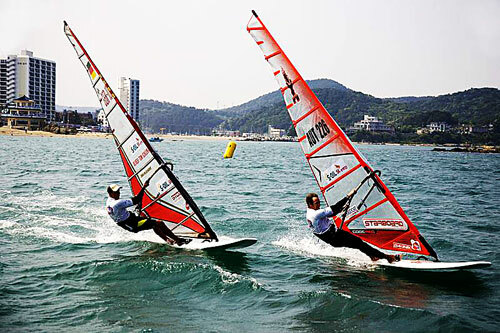 Check out the pic, blasting with Oliver-Tom Schliemann in the bay of Jinha. Shot by John Carter/PWA Worltour 2008.